Stems erect, slender, 10-75 cm, glabrous. Leaves 2-16 cm; basal leaves petiolate, segments wider than ±sessile cauline leaves. Inflorescences: involucral bracts whorled, similar to cauline leaves, curving up to surround flower. Flowers 10-50(-60) mm diam. ; sepals blue, sometimes pink or white, short-clawed, 8-25 × 3-15 mm, apex entire to irregularly incised or lobed, occasionally lacerate; petals clawed, abaxial lip distally 2-lobed, bearing 2-3 nectar glands or apex expanded, adaxial lip scalelike. Capsules smooth, 8-35 mm; locules 5-10; beak persistent, slender. Flowering late spring-early fall. Dump sites and waste places; 0-400 m; introduced; B.C., Ont., Que. ; Ill., Kans., Md., Mich., Mo., N.Y., Ohio, Oreg., Pa., Tenn., W.Va.; native to Eurasia. Nigella damascena is frequently cultivated as an ornamental and for dried-flower arrangements. It occasionally escapes cultivation and may become established. Populations in Ontario and Quebec, and probably elsewhere, are short-lived. 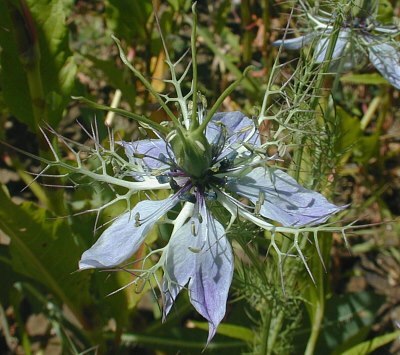 Most North American populations of Nigella damascena are represented by a mixture of single- and double-flowered (having supernumerary flower parts) individuals. Sepals tend to be larger and more variable in color than in Eurasian plants. Single-flowered plants usually have petals; petals appear to be absent in double-flowered individuals. Plant 3-6 dm; fls bluish, 3-4 cm wide, closely subtended by an involucre of dissected lvs; staminodes villous; 2n=12. Native of s. Europe, occasionally escaped from cult. in our range.